Our 1st and 3rd Friday Shabbat services always end with an opportunity for people to socialize, to talk over the ideas Rabbi Eva has shared with us, and to meet one another. Sponsoring an Oneg Shabbat is a lovely way to share with the Shul of New York family. Any reason is a good reason to sponsor an Oneg! Perhaps you are celebrating a special event (a birth, baby-naming, engagement, wedding, anniversary, graduation, Bar/Bat Mitzvah). You may want to remember a loved one in a special way, or celebrate a return to health, or a new job, etc. We welcome you to sign up in advance to provide a simple buffet to be enjoyed by all. Feeding others is a nourishing, community building experience in so many ways! We will make every effort to accommodate your first choice of a date. We recommend that you schedule your Oneg at least 2 months in advance. In the rare event that 2 occasions fall on the same date, the Shul's Oneg Coordinator, Carrie Schwartz will contact each sponsor to discuss sharing the Oneg. You must contact the Oneg Coordinator, Carrie Schwartz, to schedule a date and for help with your planning. Please include the requested date and the person(s) or event being honored. 2018: Aug 17, Sep 7, Sep 21, Oct 5, Oct 19, Nov 9, Nov 16, Dec 7, Dec 21. Jun 7, Jun 21, Aug 23. We, of course, welcome your DIY version of the Oneg following the guidelines below. However, we can do the legwork for you. Shul volunteers will do the shopping, set up and clean up of your Oneg. The donation for a Shul prepared Oneg is $154. NOTE: You may make the donation on the form below after you have scheduled a date with Carrie. We cannot guarantee a date that has not been pre-approved by the Oneg Coordinator. The following guidelines will help you to plan your Oneg. 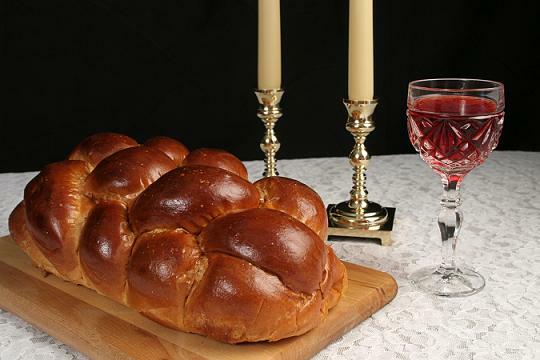 Required Items: 1 challah, 2 bottles of red wine, 1 bottle of red grape juice. Foods to consider: Easily served finger foods such as: cheese & crackers, hummus & pita, nuts, grapes, something sweet, etc. Paper goods: We can supply paper plates, cups and utensils. If you prefer to bring your own you may do so, but taking any extras will be your responsibility. The Shul has very limited storage space. Judging quantities: Remember, the Oneg is a nosh, not a meal! We tend to average about 20 to 25 people at services, plus your invited guests. The Oneg Coordinator can help you decide how much food is needed. Leftovers: Removing or disposing of leftovers will be the responsibility of the Oneg sponsors, so please don't bring too much. Trash and recycling bins are available. Shul volunteers may be available to help you with your set up and clean up. You can discuss this with Carrie when you arrange for your Oneg date. The staff of Middle Collegiate Church cannot accept deliveries of any kind. Deliveries may be made at 6pm when you or Shul helpers are there to receive them. PLEASE NOTE: FDNY regulations prohibit open flames of any kind in any part of Middle Collegiate Church. You must schedule a date with the Oneg Coordinator before using this form. All dates must be pre-approved by the Oneg Coordinator. * Event or Person being honored or memoralized. Please do not use this form if you are supplying the oneg. You donation is not complete until you submit payment on the checkout page. Note: You can avoid the captcha verification box by logging in or registering at the top of the page.